Forty-nine pages of inventive prose. Forty-nine pages of vivid encyclopedic display. Forty-nine pages of micro fiction, micro nonfiction, to bundle fabrics of reality, to bend perceptions of the human experience. 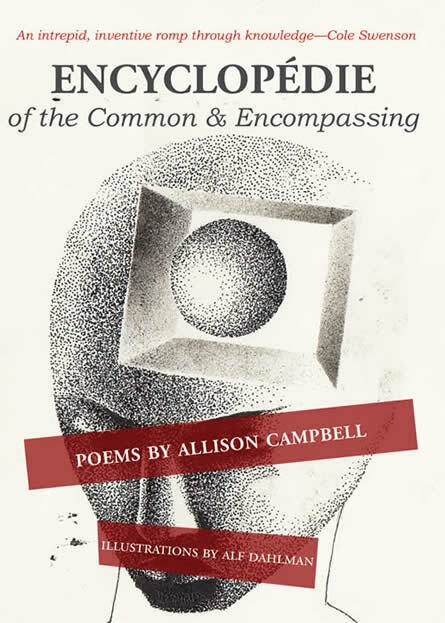 Allison Campbell’s Encyclopédie of the Common and Encompassing is not the type of book encountered very often, which makes it stand the test of the experimental form and avoid the burden of expectation through surprise, delight, and (at its finest moments, with due acknowledgment of the accompanied, twisted images by illustrator Alf Dahlman) the dark, uncanny, and grotesque. I like you in front of them. Your hair blowing in a breeze that moves on to rub against what once were dragon shoulders and chests and toes. Let the roads pave themselves before or after them. Frame them. Encyclopédie benefits from an estranged reading relationship. The physical book is thin, flexible, and portable. 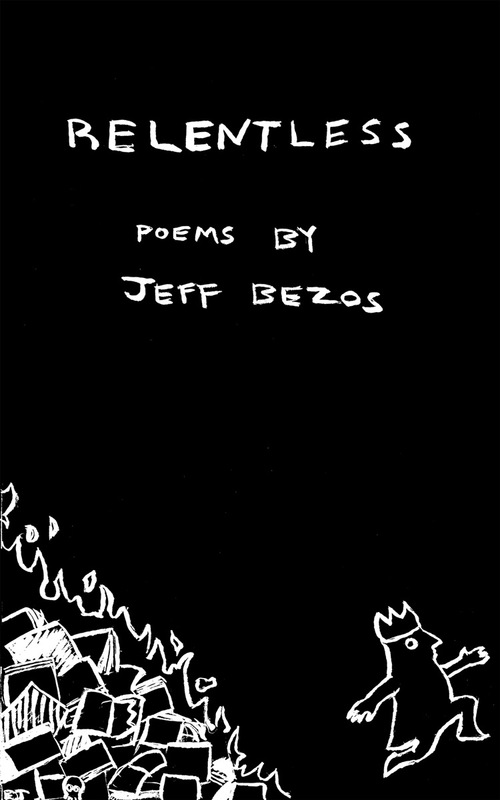 Once opened, the text captures the imagination like the best postmodern writing: interrelated fragments spur on questions, lead us forward through our most damning and damaging insights, or our most intrepid and cathartic ponderings. The book is as much a list as it is a pile of needles burying a thread of hay. I was reminded of Hopscotch and House of Leaves in the book’s capacity to be referential, to be opened, considered, and closed; to be jabbed and coarsely ground, the pages durable in the soft light, and the hard focus. Alphabetically sorted from “Accident” to “&,” Campbell provides us with a swirling world that leads us astray to a perfect mode of discombobulation and then back again into the stalwart reader’s poise. With links between entries (“See _______” embedded throughout most) the world is fortified and concerned with itself. This is intelligent writing. This book is a fascinating moment of literary architecture, and it’s as joyous as it is disturbed. But, now we have writing and more than that, picture shows. At the end of books, the empty page is a symbol. In movies, at one point, all pictures stop. You see a certain color of blank screen that tells you everything you were seeing is over. Little pig, little pig, let me come in. Reader, what part of you is the end of you? When do you end? You cannot live an answer. Which is why this idea, this end, is the most invented of human inventions. We create boundaries, and it’s convenient to image them whether or not they exist [see IMMIGRANTS]. Flipping from crease to crease, Dahlman’s images surmount the passivity and reservations that greet us before the text is read. 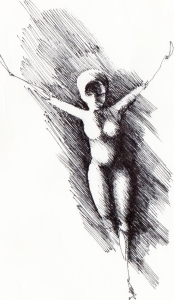 The first image: two legs, clothed with feet bearing shoes, sticking up toward the top of the book. Flip forward. A person in a suit with a rectangle missing from the center of their head, hands clutching the cubic absence, the face, near their chest. Flip forward. 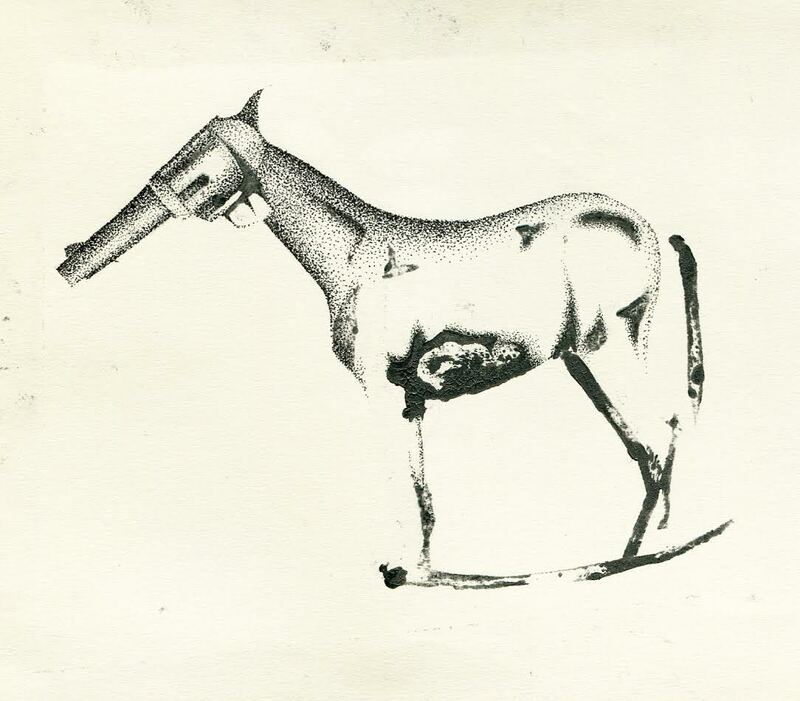 A rocking horse with a pistol for a head, pointed down, like a snout, toward the landscape beyond the page, in front of them. Flip forward. 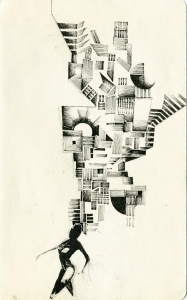 The Dadaesque eruption of staircases and other geometric, quite-spiraled shapes opening up the image beyond a staggered, strolling figure in silhouette. Dahlman splices the text that is already spliced. There is a quantum nature of the cubist and an antithetical, radical nature of the Dadaist that furthers this book, attends to our attentions, ruptures our smooth and bubble-less receptions. Dahlman provides a shadow (or a spine) to an otherwise full and functioning being of a book, and the lasting impressions are horrific, dreamlike, and memorable as we move on, and outward as readers. These pictures stick us like knives in our bellies. We are not as unconsciously self-organizing as nature, but our material parts are [see BODY]. We are a bunch of straight lines that repeat themselves into curves. Even our curves are patterns. The movement from entry to entry is as much about exploring Campbell’s dilated documentation of the world as it is about our own reflections, be they quasi-philosophical, quasi-conceptual, quasi-homely, quasi-humanist. There is as much mirror here, as much Campbell as Campbell, as there is the greater echo chamber of our mutual world. A book like this is as important today as it will be tomorrow, touching on universal bodies of knowledge, patterns and forward momentums in mass identity, that in turn breaks down quite well into the role of the individual. As a form of diary, Campbell brings the streets and friends and gutters and lovers alive through an endured temporal we otherwise would call fraying. As a form of recorded hallucination, Campbell blends and merges, reforms into new currents the otherwise exceptionally quixotic nature of the realms of moments surrounding us. There is much logic and process in Encyclopédie as there is spontaneity and impulse. This harmony transfixed and transforms, locks book in hand, and the effect is as mesmerizing as it is beautiful. Rain is what comes down. If something is coming up, it is not rain. Rain is cold but can feel warm on the right day. It will not make you dry, no matter how much you let it hit you. It can make you happy or sad, depending upon the hour and how sensitive you are. A drop of water is not rain, the same way a person cannot be people. It will get you wet. Rain is often compared to crying. It is not crying, though crying in it can be convenient—your emotions may be less exposed—your face in the confusion of moisture may just look waterlogged. Perfect. As we go about our lives, in the last remaining slivers of 2016, and beyond into the beginning of the chaos of 2017, books like Campbell’s will further our justifiable, and well-intended relationship to poetic and intimate writing. These books keep the fluctuating spirit of humanity human. They show us the sparks and the muffles. The vibrations and the hollows. There is a moment of invitation in writing like that found in Encyclopédie that will keep our heads upright and our mouths and our minds quivering toward the future. A spectrum of anticipation and hope becomes incited by words, by entries, by the worlds and worldviews of our best artists. Campbell is one of them. Explore more and/or acquire Allison Campbell’s Encyclopédie of the Common and Encompassing here.